Tasawwaf (Sufism) as a science has evolved from the Quranic and hadithic concepts of Tazkiyyah and Ihsan, just as fiqh has evolved from ‘Islam’ and Aqeedah/creed has evolved from ‘Iman’. All three Iman, Islam and Ihsan are mentioned together and are explained as Deen in the famous ‘hadith of Jibraeel’ narrated in both Bukhari and Muslim. All great classical scholars were also sufis as well as being great mufassireen and muhaditheen (interpretors of Quran and Hadith) of their times. Most of them wrote books on this subject before books on hadith were compiled. The first person to use the term ‘tasawwuf’ was Imam Malik. Tasawwuf means being truthful with the truth and on your best behaviour with the creation of Allah (Abd al-Qadir, 1997). Sufism is a science which deals with the reparation of the heart and its association with Almighty Allah. The basic ideology of Sufism is to keep all the worldly desires and joys absent from our hearts so that our Lord and His love can make inroads into our hearts. According to one of the great Sufis, Shaykh Abd al-Qadir al-Jilani, a Sufi is the one who is clear of blights of the lower self, devoid of its blameworthy characteristics and travels to one whose ways are praiseworthy and admirable. Shaykh Abd al-Qadir al-Jilani (may Allah be well pleased with him) was born in the Iranian district of Gilan, South of the Caspian Sea, in 470AH/1077–8 CE. According to the lunar calendar, he was born on the 1st of Ramadan (Abd al-Qadir, 1992). After his birth, Shaykh Abd al-Qadir’s mother said that on the day of his birth he would not take a sip of milk in the day time and that he would fast for the whole day (Abd al-Qadir, 1992). This indicated that he was not an ordinary person but a man with spiritual and mystical qualities who would fast on the day of his birth to welcome the month of Ramadan (Al-Tadifi, 1998). At the age of 18 Shaykh Abd al-Qadir migrated to Baghdad, Iraq and became a student under illustrious Shaykhs of the time. For 25 years Shaykh Abd al-Qadir roamed the deserts of Baghdad which brought great changes in him and opened his path to many new spiritual experiences (Al-Tadifi, 1998). After attaining the highest status in the spiritual world, Shaykh Abd al-Qadir became known as the Sultan of all saints and was also known among the greatest scholarly Sufis (Al-Tadifi, 1998). Shaykh Abd al-Qadir has written many books that have now been translated in many languages including English and other European languages. His words and teachings are undoubtedly considered among the most precious treasures of Islam. 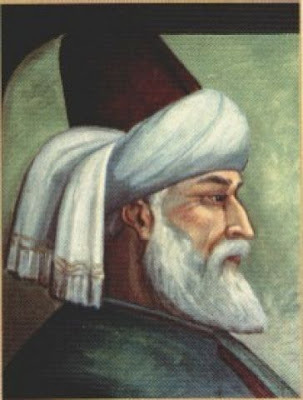 Mawlana Jalal al-Din al-Rumi (may Allah be well pleased with him) was born on September 30, 1207 CE in the city of Balkh, in modern Afghanistan (Gulen, 2005, p. 11). Rumi attained most of his spiritual teachings from his father Baha al-Din also known as Sultan of the scholars (Gulen, 2005, p. 46). With the death of his father, Jalal al-Din al-Rumi not only lost his father but also a spiritual guide, a friend and source of knowledge and virtue. After this great loss Rumi recovered and found himself in the company of another spiritual guide i.e., his father’s friend Shaykh Burhan al-Din, a great man whom Rumi had admired since childhood (Gulen, 2005, p. 46). After many years of studying under the spiritual guidance of numerous scholars, Rumi finally developed and established within himself a new person who was not the Rumi his surroundings knew but the Rumi that we now know today, the great poet of Almighty Allah, a compassionate humanitarian and above all a true lover of Allah and His beloved Prophet Muhammad (blessings and peace be upon him). Rumi’s love for Almighty Allah was beyond the understanding of a normal person. He wrote books of poetry in the love of Almighty Allah from which two are known worldwide, the Mathnawi and Divan Kabir (Gulen, 2005, p. 46). Rumi never saw himself as a poet, although he was counted among the greatest poets of all times. Rumi once said that poets write poetry to make themselves known, but the poets of Almighty Allah write poetry to make Almighty Allah known (Gulen, 2005, p. 201). Rumi indeed reminds us of the message of true love and acceptance of diversity that is the true essence of Islam. All Sufi and mystical ideologies and pronouncements discussed by famous Sufis of all times have one thing in common—the Sufi path. All mystics throughout their lives strive for one thing and that is the love of Almighty Allah, for that they detach themselves from the world mentally, and some physically as well. All Sufis have the same path to follow and achieve the same goal, but they use different ways and sources to convey their mystical message to the world. Shaykh Abd al-Qadir al-Jilani and Mawlana Jalal al-Din al-Rumi have many similarities in their mystical pronouncements. The first pronouncement that both Sufis—Shaykh Abd al-Qadir al-Jilani and Mawlana Jalal al-Din al-Rumi—have equally emphasized on is the absolute trust in Almighty Allah and true obedience to Holy Prophet (blessings and peace be upon him). Shaykh Abd al-Qadir al-Jilani has explained this by mentioning three stages of complete trust and obedience to Almighty Allah: first stage is called tawakkul—complete trust in Almighty Allah and leaving all decisions to Him; second stage is tasleem—complete surrender of oneself; and the last stage is tafwid—an act of complete delegation to Almighty Allah, leaving everything to Him, since He is the decision-Maker (Abd-al-Qadir, 1997, p. 114). On the other hand Mawlana Jalal al-Din al-Rumi has added to Shaykh Abd al-Qadir’s view that human beings’ sustenance is in the hands of Allah and everything that happens is His will (Turkmen, 2002, p. 238). For this reason it is important that we follow His commands, submit to Him and trust Him completely. The second point that is comparable in the teachings of both Sufis is the freedom from gold and silver as Rumi describes in his poetry. He advises the Muslims not to be captive of worldly desires and wealth and not get entrapped by worldly snares (Turkmen, 2002, pp. 77–79; and Abd al-Qadir, 1992, p. 15). According to Rumi the essence of life does not lie in worldly wealth and joys, but rather it is present in love and acceptance of Almighty Allah. Shaykh Abd al-Qadir al-Jilani has focused on a similar idea. He states that this world’s wealth, ornaments and charming influences are deceptive and poisonous. We have to escape from the world’s greed and lust and detach ourselves from the love of the world (Abd al-Qadir, 1992, p. 15). According to him if the worldly desires live in our hearts then there is no room for Almighty Allah to enter. So if we detach ourselves from the world then we will be able to attach ourselves with Almighty Allah and would enjoy pleasant blessings of the life hereafter. The third similarity between Shaykh Abd al-Qadir and Mawlana Jalal al-Din al-Rumi is the State of Extinction (fana) – annihilation of one’s self that they have talked about (Abd al-Qadir, 1992, p.16; and Turkmen, 2002). Shaykh Abd al-Qadir states that fana signifies our lower self, and our isolation and detachment from the desires of the lower self (Abd al-Qadir, 1992, p. 16). According to him fana also means getting rid of selfish interests by attaching ourselves to the will of Allah and by coming under the control of the commandments of Almighty Allah. Rumi on the other hand describes this concept in different words in a more analogical way. He says that we should ‘extinguish our fire of lust with the water of divine light’ (Turkmen, 2002, p. 60). In other words he advises Muslims to pour water on the fire of passion of worldly desires so that the fire may change into light and the love of Almighty Allah. He also says that we would certainly break our jar of selfhood if we discover the sweet and endless spiritual ocean which he refers to as the light and endless desire to gain the love of Almighty Allah. These were the similarities between the teachings of Shaykh Abd al-Qadir al-Jilani and Mawlana Jalal al-Din al-Rumi. As I mentioned earlier, there are no contradictions between different Sufis and their ideologies. However there are certain teachings that have been emphasized more by one saint and less by another, and this is the case in the pronouncements of Shaykh Abd al-Qadir and Mawlana Rum. Shaykh Abd al-Qadir has conveyed his spiritual message and ideologies through books and lectures and has adopted the way of a scholarly Sufi; his expression was direct and explicit in the form of spiritual advice and scholarly explanations. On the other hand, Jalal al-Din has best conveyed his message and his divine knowledge through his poetry. He adopted the style of poetic rhyme and narrative stories. His way of expression is often figurative and metaphorical for delivering his divine message. Shaykh Abd al-Qadir has emphasised the important virtues and moral excellence of Islam. The three main virtues are thankfulness, patience and truthfulness (Abd al-Qadir, 1997, v. 5, p. 134). According to Shaykh Abd al-Qadir thankfulness is, in fact, an act of praising the beneficent person by mentioning his favours. In other words the servant’s thankfulness to his Lord is expressed through praise he offers to Him and it represents his worshipful obedience to Almighty Allah. The second virtue is patience, an act of tolerance to afflictions and hardships in all circumstances. According to Shaykh Abd al-Qadir there are three kinds of patience that are normally obtained by Sufis: firstly, patience for the sake of Almighty Allah, where a person should strictly do what Almighty Allah has commanded him to do and strictly avoid that which is forbidden (Abd al-Qadir, 1997, p. 141). The second kind of patience relates to bearing hardships, in which a person should tolerate all the hardships that come when striving in the path of Allah. The last kind is patience is in anticipation of Allah. In this a person should wait patiently and calmly for whatever Almighty Allah has promised him in the way of sustenance, joyful relief and rewards for hereafter (Abd al-Qadir, 1997, p. 141). The last virtue is sidq—truthfulness; an act of speaking what is true in any circumstance, it also means that no distinction is made between what is believed in private and what is professed in public (Abd al-Qadir, 1997, p. 158). A person who makes truthfulness a constant practice as a habit is known as sadiq—the truthful (Abd al-Qadir, 1997, v. 5, p. 158). These virtues and moral excellence are the basis of the Sufi path. Rumi has also extraordinarily emphasised on the universality of love. The major theme of Rumi’s Mathnawi is the love of Almighty Allah and it is in fact a love letter written to the unseen Beloved Almighty Allah (Turkmen, 2005, p. 243). Rumi says that love is above the boundaries of time, space, or even religion as Almighty Allah is the source of every being so He is the source of love as well (Turkmen, 2005, p. 243). We are all His creation and He is indeed the centre of love and everything in the world ultimately leads us to Him. Rumi in his poetic words has mentioned several times that ‘love is the remedy of all illnesses’ and he also says that lovers of Almighty Allah never die because His love cannot be buried. Shaykh Abd al-Qadir al-Jilani has placed more emphasis on the exoteric – the outer self and the esoteric – the inner self of the person and how the combination of both leads to the ultimate reality and truth of Almighty Allah (Abd al-Qadir, 2000, p. 10). He says that the knowledge is sent down to us in two ways. Exoteric knowledge refers to the Shariah law and the esoteric refers to the direct understanding of Almighty Allah (Abd al-Qadir, 2000, p. 10). He said that in order to reach the truth it is important to have knowledge of both; the inner and outer. He explains through quoting a verse from the Qur’an saying, ‘Almighty Allah has partitioned the two seas, they meet, but there is a barrier that they do not overpass,’ (Lewis, 2000, p. 10). In other words reality cannot be attained and the goals cannot be reached without the combination of both ways of knowledge. On the other hand Rumi has emphasized more on the spiritual orientation and reason versus spirit (Lewis, 2000, p. 404). Rumi teaches that a man’s purpose is to achieve a proper spiritual orientation and that can be possible through love and adherence to Almighty Allah and not through reasons and skills (Lewis, 2000, p. 404). According to Rumi’s Mathnawi, ‘you attain to knowledge by argument, you attain a craft or skill by practice, but spiritual poverty is won by companionship, not by hand or tongue’ (Mathnawi, 2001, VI Vr:1062; and Lewis, 2000, p. 404). In other words Rumi has said that in order to attain the spiritual knowledge it is important to have a companion or a guide that will lead you to the reality rather than your learned skills. Rumi also emphasized on reason versus spirit. He says that there are two different quests, the intellectual quest and the spiritual quest. The intellectual quest or the senses perceive causes and effects whereas the spiritual quest perceives wonders upon wonders and the whole process of wondrous spirit can lead us to see the truth, the truth of Almighty Allah (Lewis, 2000, p. 400). Rumi has mentioned in his Mathnawi that ‘how much of all this wisdom of the Greeks, don’t forget to read the faithful’s wisdom’ (Lewis, 2000, p. 400; and Mathnawi, 2001 V5 Vr:1763). In other words he says that you can gain much of the world’s knowledge and yet the intellect will only take you far enough to gain worldly success and fame, however if you urge to go on a spiritual journey you will be able to reach further in the light of spiritual guidance to understand the true reality of our mighty Lord. Shaykh Abd al-Qadir al-Jilani has focused and emphasized more on the compliance of Almighty Allah and seeking His pleasure than Rumi (Abd al-Qadir, 1992, p. 33). Almighty Allah is the decision maker and whatever happens to us is by His decree; either we ask for the suffering to go away or confront it with patience to please the Lord. Our only resort is total surrender and submission to Almighty Allah (Abd al-Qadir, 1992, p. 33). If our life is happy and joyful, we must serve it in gratitude and if it is full of hardships then we must practice total patience and perseverance to seek the pleasure of Almighty Allah (Abd al-Qadir, 1992, p. 33). On the other hand Rumi has focused on the observation of Almighty Allah in every phenomenon of the world. He says that everything that exists in the world is the reflection of its Creator and our Lord; it is the spiritual essence that is in us or in other things that leads us to Him (Turkmen, 2002, p. 331). In Rumi’s Mathnawi it is stated that everyone turns towards some direction, but the saints have turned towards the direction without directions (Mathnawi, 2001 VI. Vr:3712). In simple words Rumi is saying that wherever a person turns around in the world he will find Almighty Allah everywhere because Almighty Allah exists in every phenomenon of the world and we are in the world of Almighty Allah where it is impossible to find anyone other than Him. Modern day lifestyles force people to engage in an excessive struggle to gain power and make their living luxurious. In that process they kill their spiritual side of being a human (Gulen, 2005, pg. 30). People often do not listen to or read what our prophets, saints, scholars, philosophers and poets have said, but instead they occupy their time in fulfilling their endless desires and hence they almost lose the humanitarian aspect of life (Gulen, 2005, p. 30). In the history of Islam, Shaykh Abd al-Qadir al-Jilani and Mawlana Jalal al-Din al-Rumi stand out as being unique in the broader scope of spiritual perfection. This perfection includes their knowledge, devotion and adherence to Almighty Allah. Both have made this point very clear in their teachings; that the true essence of life lies within the love of Almighty Allah and total submission to Him as a faithful servant. They think their highest, they feel their deepest and they live their best with total surrender, delegation and devotion to Allah. 1. Shaykh-ul-Islam Dr Muhammad Tahir-ul-Qadri, 2007, Al- Hidayah lecture series. 2. Al-Jilani, A. (1992). Revelation of the Unseen (Futuh-al-Ghayb).Fort Lauderdale: FL: Al-Baz. 3. Al-Jilani, A. (2000). Books of Secrets of Secrets and the Manifestation of light. Al-Baz: Fort Lauderdale. 4 .Gulen, F. (2005). Rumi’s Thoughts. oneworld: Oxford. 5. JILIANI, A. (1997). Sufficient provision for seekers of the path of truth (Al-Ghunya li-Talibi Tariq al-Haqq) . FL: Al-Baz : Fort Lauderdale. 6. Nicholson, R. A. (2001). The Mathnawi of Jalalud din Rumi: edited from the oldest manuscripts available. Lahore: Sang-e-Meel Publications. 7. Rūmī, M. (2000). Rumi: past and present, East and West : the life, teaching and poetry of Jalâl al-Din Rumi. Oxford: Oneworld. 8. Tādhifī, M. i., & Holland, M. (1998). Necklaces of gems = Qalā’id al-jawāhir : a biography of the crown of the saints Shaykh ‘Abd al-Qādir al-Jīlānī. Fort Lauderdale, FL: Al-Baz Pub. 9. Türkmen, E. (2002). The essence of Rumi’s Masnevi: including his life and works. Ankara: Ministry of Culture.